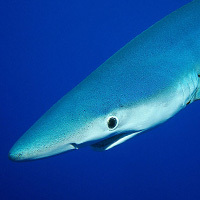 Blue shark is caught in all open waters with the exception of the Arctic Ocean and nearby coast of Antarctica. A large amount of blue shark is caught in the waters surrounding Japan. Cartilage from blue shark is used as a calcium supplement to prevent osteoporosis. In cooking it can be fired, boiled in soy sauce, and prepared many other ways. The calories in Blue Shark per 120g(1fillet) is 102 calories. Blue Shark is calculated to be 85Cal per 100 grams making 80Cal equivalent to 94.12g with 22.68g of mostly protein、0.72g of fat、0g of carbohydrates in 120g while being rich in vitamins and minerals such as Vitamin B6 and Vitamin E Alpha Tocopherol.